As is often said, real estate is about location, location, location. We have extensive knowledge of the Palm Harbor, FL area and can help you find the right home for you or the right buyer for your home. I believe that Real Estate is one of the soundest investments you can make, and owning where you live is a great way to have your cake and eat it too. You not only enjoy a wonderful home, but the money you spend is not thrown away. Plus, you gain tax advantages that are not available to non-owners. With this in mind, you deserve a conscientious, hardworking Realtor® who'll always be on your side to find that perfect blend of home and investment . When you work with me you get the real deal. I explain the market as it exists, give examples of other properties, and show visual materials, as aids in helping you understand just what you're getting into. With extensive knowledge of the area and having been in business in the Tampa Bay area for over 20 years, Demetri brings a wealth of knowledge and expertise to our team. 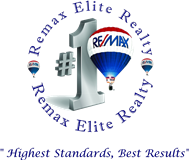 As a member of the RE/MAX Team, I am supported by the most recognized and highly respected Real Estate company in the nation.